Adobe Photoshop Touch was just demoed on stage here at Adobe MAX, dropping quite a few jaws and grabbing enough cheers to get us excited. I actually booked it immediately after the on-stage walk-through over to Samsung’s booth to get some hands-on time with it and I’ve got to say, that this is going to be one cool tool when it launches in November. As a piece of software that won’t be here for another month, it was very polished, easy to navigate, and powerful. While I am by no means a PS pro, I saw every tool, brush, and setting that gets me through my day. The tablet that Adobe is using to showcase it on is a prototype from Samsung that they won’t reveal much on (no it’s not running Ice Cream Sandwich). It was built specifically for their new pen technology that is pressure sensitive and allows you to draw, erase and choose colors in a jiff. In fact, we aren’t sure this model will ever make it to stores, but the idea of this type of pen experience on a tablet is intriguing. The app will run $9.99 when it is released. Update: In the Adobe executive team Q&A that is going on right now, one question brought up the idea of plug-ins to Photoshop Touch. Would there ever be any? As of now, there are no plans, but you get the feeling that Adobe has already thought about it and will possibly introduce them in the future. They did point out though, that tablets right now are where PCs were 5 years ago. What they mean by that is that we have a long way to go before tablets can even come close to what we can currently do on a computer. Could plug-ins come in the next year? Possibly. I think NVIDIA’s quad-core processor is a step towards this happening. Update 2: In case anyone was wondering, all of their new Touch apps were built in Adobe AIR. Press release, including their other new Touch apps below. LOS ANGELES–(EON: Enhanced Online News)–At its MAX 2011 technology conference, Adobe Systems Incorporated (Nasdaq:ADBE) today announced Adobe® Touch Apps, a family of six, intuitive touch screen applications, designed for Android tablets and Apple iPad that enable anyone to explore ideas and present their creativity anytime, anywhere. Inspired by Adobe Creative Suite® software, these stunning new apps bring professional-level creativity to millions of tablet users. The apps address multiple areas of the creative process: image editing; ideation; sketching; mood boards; website and mobile app prototyping; and presenting finished work. They are headlined by Adobe Photoshop® Touch, a groundbreaking app that brings the legendary creative and image-editing power of Photoshop to tablet devices for the first time. Available soon as standalone apps, Adobe Touch Apps are essential components of Adobe Creative Cloud, a major new company initiative also announced today (see separate release). Adobe Creative Cloud will become a worldwide hub for creativity, where millions can access desktop and tablet applications, find essential creative services, and share their best work. Files created via Adobe Touch Apps can be shared, viewed across devices or transferred into Adobe Creative Suite software for further refinement – key features of Adobe’s vision for the Creative Cloud. With stylus capabilities expected to become a key feature on some next generation tablets, Adobe Touch Apps are designed to work with both finger and stylus input. Adobe Photoshop Touch lets users transform images with core Photoshop features in an app custom-built for tablets. With simple finger gestures, users can combine multiple photos into layered images, make popular edits and apply professional effects. The tablet-exclusive Scribble Selection Tool allows users to easily extract objects in an image by simply scribbling on what to keep and then what to remove. With Refine Edge technology from Adobe Photoshop, even hard-to-select areas with soft edges, such as hair, are easily captured when making selections. Additionally, the app helps users quickly find images, share creations, and view comments through integration with Facebook and Google Search. Using the syncing capabilities that are a component of Adobe Creative Cloud, files can be opened in Adobe Photoshop. Adobe Collage helps creatives capture and refine ideas and concepts by allowing them to combine inspirational images, drawings, text and Creative Suite files into modern, conceptual mood boards. 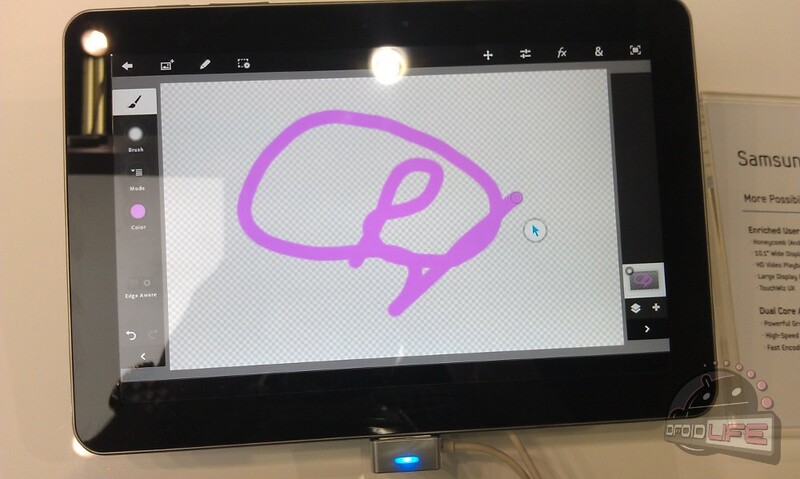 Features include importing of images, four customizable pen types for drawing, adding text, and applying color themes. A virtually unconstrained canvas grows as needed to accommodate more assets. Files can be shared or transferred for access in Adobe Photoshop. Adobe Debut allows users to present designs to clients and stakeholders virtually anywhere. Adobe Debut quickly opens tablet-compatible versions of Creative Suite files for convenient and beautiful viewing on the tablet, including Photoshop layers andIllustrator® art boards. Feedback is gathered using a markup pen tool to add notes and drawings on top of the work. Adobe Ideas is an easy-to-master, vector-based tool for drawing. By using a stylus or finger, strokes appear smooth at any zoom level. 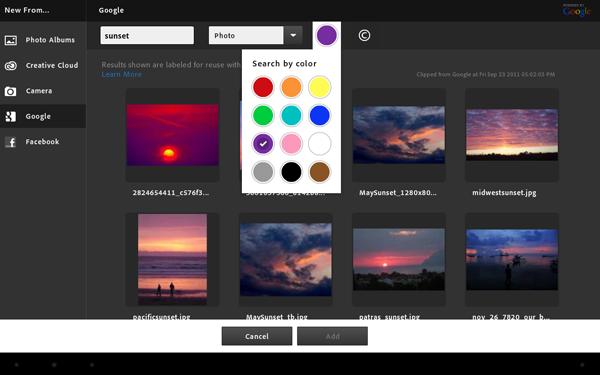 Starting with a blank canvas, users can choose color themes, and pull in tablet-compatible image files that can be controlled as separate layers. Finished results are easily accessed in Adobe Illustrator or Photoshop. Adobe Kuler makes it easy to generate color themes that can inspire any design project. Color can be explored and discovered, with hundreds of thousands of Kuler themes already available via the creative community. Social engagement in the community is enhanced by rating and commenting on themes, which can be exported as color swatches for Adobe Creative Suite projects. Adobe Touch Apps build on the launch of Adobe Carousel, the only photography solution that gives access to your entire photo library across your tablets, smartphones and desktops — no storage issues, no manual syncing hassles. Enjoy all your photos anywhere you are, and make them look terrific using the same powerful photo-processing technology as Adobe Photoshop Lightroom® software. Adobe Touch Apps will be available for Android devices in November 2011. Adobe expects to make an announcement regarding iOS availability in early 2012. Adobe Ideas is already available for the iPad. Introductory pricing is US$9.99 for each app. Access to the file viewing, sharing and transfer functionality of Adobe Creative Cloud is included in the price of each Adobe Touch App. Details regarding pricing of the Adobe Creative Cloud and its expanded capabilities around applications, services and community will be announced in November 2011. © 2011 Adobe Systems Incorporated. All rights reserved. Adobe, the Adobe logo, Creative Suite, Photoshop, Illustrator and Lightroom are either registered trademarks or trademarks of Adobe Systems Incorporated in the United States and/or other countries. All other trademarks are the property of their respective owners. Verizon Announces Florida's First 4G LTE "C.O.W."